This talk was given in March 2012 at the annual Maine Humanities Council Winter Weekend Seminar, at Bowdoin College, Brunswick Maine. As Caroline Alexander put it in her talk at the Carnegie Council a couple of years ago, the epic of the Iliad is much more than “a slugging story.” The poem invites us to reflect on the nature of war itself, and the use of force as it shapes our understanding of virtues such as honor and responsibility and vices such as excessive pride, vengeance and cruelty. My focus arises from new attention given to these questions by Steven Pinker and others who use historical data and insights from brain science and moral psychology to suggest that violence is in decline. In his new book The Better Angels of Our Nature Pinker uses statistical evidence to show that over the centuries, human beings have become less inclined to kill each other and to engage in barbarous and cruel practices. As Pinker puts it, “Brutal customs, once commonplace have been abolished: cannibalism, human sacrifice, heretic burning, chattel slavery, punitive mutilation, sadistic executions.” Battle deaths worldwide have declined drastically: the rate of death has plunged from 300 per 100,000 of world population during World War II …to fewer than 1 per 100,000 in the 21st century. Pinker does not suggest we are reaching a state of perpetual peace. Rather, he concludes: “…we still harbor demons like greed, dominance, revenge and self-deception. But we also have faculties that inhibit them, like self-control, empathy, reason, and a sense of fairness.” It is these latter faculties that seem to be winning out. Pinker’s provocative argument suggests we might benefit from revisiting conventional ideas about human impulses toward conflict and cooperation. Weil, like many before her, emphasizes the base, vulgar instincts that lead us to fight not only for self-defense but also for conquest. However, could it be that human beings are hard-wired for cooperation just as much as for conflict? After all, doesn’t human survival depend on cooperation as much if not more than on conflict? Pinker leads us to consider aspects of both nature and nurture that emphasize the capacity to cooperate. A “nature” argument for cooperation suggests we take seriously the moral instinct of empathy and the human capacity for reason. A “nurture” argument for cooperation suggests that standards and expectations have evolved in light of experience—that human society has created new rules and new institutions to reflect a kind of moral evolution. However we answer these questions, it seems logical to consult first with Homer. Homer provides a reference point, a point of reckoning. Do we want to make a case for moral progress when it comes to the use of force, violence, and war? This is a question worth considering. The true hero, the true subject, the center of the Iliad is force. Force employed by man, force that enslaves man, force before which man’s flesh shrinks away. In this work, at all times, the human spirit is shown as modified by its relations with force, as swept away, blinded by the very force it imagined it could handle, as deformed by the weight of the force it submits to. For those dreamers who considered that force, thanks to progress, would soon be a thing of the past, the Iliad could appear as a historical document; for others, whose power of recognition are more acute and who perceive force, today, as of yesterday, at the very center of human history, the Iliad is the purest and the loveliest of mirrors. War is hell. You get the picture. What surprises the modern reader is how routine it seems and how cavalierly it is accepted. than sailing hollow ships to their dear native land. War binds men together in a set of trying circumstances that cannot be duplicated. They become attracted if not addicted to its energy. Contemporary journalists have examined this response in great detail. Christopher Hedges has written the book War is a Force That Gives Us Meaning where he describes war as “a drug” and a vehicle that engages “lust and passions.” He describes the odd beauty of war— the “lust of the eye”—that appreciates the awesome spectacles of war machines and their destructive powers. (If any of you have ever stood on the bridge of an aircraft carrier or seen a naval fleet at sea, you will understand what he means—the power and capacity of these vessels is an awesome sight to behold.) Hedges emphasizes the solidarity that emerges among men who bond over the powerful instruments they command and the dangers they face together. Junger speculates about a variety factors that draw men to war: thrill, adventure, duty, brotherhood. The experience of war is intense, and some cannot let it go. The Academy Award winning movie The Hurt Locker focused on the theme of the magnetic attraction to war. At the end of the film, the protagonist, who has repeatedly volunteered for and survived the most hazardous duty imaginable, cannot abide the peacefulness of home upon the end of his tour of duty. He must go back. Like the moth to the flame, he is addicted to the danger and the fight. Bernard Knox sums up Homer’s realism this way: “Three thousand years have not changed the human condition in this respect. We are still lovers and victims of the will to violence, and so long as we are, Homer will be read as its truest interpreter.” (Fagles, 29) “Lovers and victims of the will to violence”—this is a phrase worth repeating. The “lover” part may be hard to accept, but it would be foolish to deny. In addition to the perverse attraction to war, there is also a deeply ingrained idea that war is inevitable. Friedrich Nietzsche cited human nature as the source of this acceptance. There was, Nietzsche said, a will to power, that is inescapable. Ancient and modern political philosophers express this idea in different ways. Thucydides observed that men resort to war for three reasons: interests (meaning material benefit), fear, and honor. Thomas Hobbes observed that in the state of nature—meaning in the natural world—there is no controlling authority. According to Hobbes, we live an anarchic and unstable world where in pre-modern times life was “solitary, nasty, brutish and short.” Contemporary realists take this idea to mean that we live in a world of competition and constant threats that create a structural security dilemma. We can never trust opponents not to press their advantage. So we must always be willing to fight to maintain our power position. They would revile me in public. But I am not to blame! On my own authority, true, but what could I do? By making war a choice of the gods, Homer seems to be indicating that the mortals cannot control behaviors and outcomes. The impulses come from above and below. The philosopher Sean Kelly makes an interesting point about this. As modern readers, we are used to the idea that individual actors should take responsibility for their actions. However, Kelley says that “Homer’s characters are, by contrast, primitive.” The gods are great forces outside of the human experience; and yet it is they who determine the outcomes. The gods represent the best and worst, and they show us both the possibilities and limitations of human behavior. If nothing else, the gods remind us of the overwhelming powers of the natural world that are greater than ourselves. They are, in some ways, very human in that they pursue rivalries and jealousies. Their actions mirror the trials and tribulations of the mortals they direct. However, in the end they are gods: they live in perpetuity to continue never-ending cycles of conflict and emotion that transcend the life of any single individual. don’t let the dogs devour me by the Argive ships! Having strung Hector to his chariot, Achilles proceeds to “haul him three times around Patroclus’s tomb;” and then keeps the corpse in this degraded state for good measure while Patroclus’s funeral is being prepared. What good will it do him? What honor will he gain? The gods leave us with a clear message. In war, there is such thing as atrocity. Atrocity begins with the de-humanization of the other. In his writings on “Totem and Taboo,” Freud included an entire section on “The Treatment of Enemies,” written in the 1910s. Freud wrote, “Inclined as we may have been to ascribe to savage and semi-savage races uninhibited and remorseless cruelty towards their enemies, it is of great interest to learn that with them too, the killing of a person compels the observation of a series of rules which are associated with taboo customs.” He goes on to chronicle numerous examples of pre-modern cultures that have elaborate rituals expressing respect for the dead. For example, “When the See-Dayaks of Sarawak bring home the dead from a war expedition, they treat it for months with the greatest kindness and courtesy and address it with the most endearing names in their language. The best morsels from their meals are put into its mouth, together with tidbits and cigars…It would be a great mistake to think that any derision is attached to this treatment, horrible though it may seem to be to us.” To the contrary,: this treatment of the dead body is in fact a sign of respect. What Freud is saying is this: For death to have meaning, it must be marked in way that pays respect to the fundamental breach that has occurred by the taking of the life itself. Taboo is one way to think about this. We assign a certain forbidden tag to these breaches of humanity and civilization. Honor may be another way to express this same idea. Honor is a virtue used to reinforce virtuous acts; dishonor is the result of less-than virtuous behavior. Honor is Homer’s tool for drawing the line between humanity and barbarity—there is indeed a line, and it is important. We see this idea very much alive in today’s news. Just a few weeks ago a video appeared of four U.S. Marines urinating on the corpses of three Taliban fighters. According to media reports, the response to the video was universal moral outrage and shame. This response—widely shared around the world and not least from military professionals themselves—had its roots in the recognition that this act of desecration was not only a violation of a professional code of conduct—it was a transgression of a basic moral requirement to respect the dead. We might ask ourselves why the United States and its allies go to such great lengths to enforce these norms, especially when our opponents make a great show out of violating them. The Taliban in Iraq, Pakistan and Afghanistan is famous for its beheadings. Many of you will remember the grisly video of the execution of Nicolas Berg and reports of the beheading of Daniel Pearl. You will also remember photos of burned corpses hanging from a bridge in Fallujah. Of course, who can forget the images of dead U.S. Army Rangers being dragged through the streets of Mogadishu, Somalia after the “Blackhawk Down” mishap? Examples of defilement are really too numerous to mention. I think it is precisely the fact that we seek to separate ourselves from this kind of behavior that we try to be vigilant in stopping it where we can. We do not want to be like the Taliban. We do not want to be like the Libyan rebels who beat and killed their deposed leader Mohmar Qaddafi on the streets of Tripoli. This is why the tales of abuse in the prisons of Abu Ghraib, Bagram, and Guantanamo touched a nerve for so many. This is why mass killings in Haditha during the Iraq war and My Lai during the Vietnam War trouble us so much. Abuse is dishonorable. And it is the virtue of honor that we should seek as decent and civilized human beings. Marines urinating on corpses is as old as war itself. The fundamental urge for revenge is understandable. Exhaustion and fear take their toll. Young men must in some way de-legitimize their enemy; otherwise, how can they be asked to take their lives unless they are deemed somehow unworthy to live? Homer’s depiction of Achilles’s rage helps us to understand this. In order to fight, the hero must see the enemy as deserving of death. However, even in death there are limits. Even in death—or perhaps especially in death—there is an affirmation of certain values and principles. The issue of dealing with corpses is a reminder that while we may be realists, we are not nihilists. We do find meaning in death as we do in life. How else can we explain the obverse of the defilement of battle victims? That is, why do we go to such great lengths to recover the dead bodies of our compatriots? Why do Army Rangers and Marines risk life and limb to recover dead bodies? Our military—and many others—stress the importance of never leaving behind a fallen comrade. This promise is deep in the code of military culture; it is perhaps, the primal value. No one is left behind. Again we see examples ancient and modern. In 1992, the Rangers in Mogadishu would not conclude their operation until the bodies of their brothers-in-arms were recovered. In 2004, the Israeli government famously released over 400 Palestinian and Lebanese prisoners to Hezbollah in Lebanon in exchange for the bodies of three dead IDF soldiers who remains had been held for over three years. In our poem, Priam is willing to risk his life and pay a huge ransom for the dead body of Hector. “Poor man, how much you’ve borne—pain to break the spirit! We too, today, have our moments of transgression. Achilles final act gives us some indication of how we should respond. 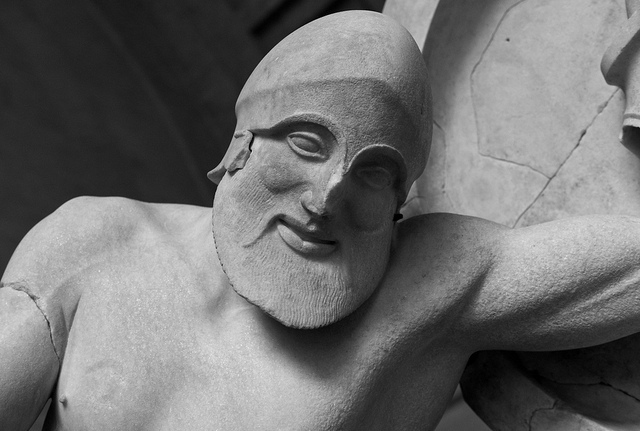 Through Achilles, Homer is telling us to recognize the humanity in others—even our enemies. The act of respecting the dead is but one way to show this. Finally if there are some aspects of war that are unchanging, are there some that evolve? That is, to return to the question raised by Steven Pinker, are the values we bring to war today really the same as they were back in the days of Argives, Acheans, and Trojans? Or have we evolved morally? I think the evidence given to us by Homer in his poem and the headlines we read in today’s newspapers leads to an answer of yes and no. My no rests on the cases mentioned above. We still see untold cruelties, humiliation and shame due to war. The brutalities continue, accompanied by emotions ranging from rage and vengeance to self-sacrifice and heroism. As long as there is war, there will be violence and transgressions of this kind. This is 100 percent predictable. My yes is based on two observations. The first is that despite the realities of ongoing atrocities, we do see a change over the centuries in terms of the norms of war. By norms, I mean rules. Norms are expected and required behavior. When it comes to war, I would argue that expectations have indeed risen over the centuries. The just war tradition of the Middle Ages evolved into the beginnings of international law in the early modern period. These efforts began a process of codifying permissions and restraints. Eventually, the Geneva Conventions in the mid-19th century brought us into the contemporary period where we recognize principles such as the protection of innocent civilians, the proper treatment of prisoners, and care for the wounded and displaced. International humanitarian law is not always decisive in determining what happens in conflict zones. However, from an ethical perspective, it seems widely accepted as an essential point of reference. It is impossible to have a discussion of war in the 21st century without reference to the moral imperatives of principles such as noncombatant immunity, discrimination in targeting, and proportionality in the use of force. My second observation is that in addition to changing norms and expectations, war itself has evolved. The industrial wars of the 20th century—massive, total wars between states—have given way to localized, internal conflict. Rather than industrial war, we have today is what General Rupert Smith calls “wars among the people.” This is not to say that war is any less brutal than it was previously. It is only to suggest that the old ways of thinking about wars—large armies on battlefields deployed like chess pieces—is most likely a thing of the past. Force will continued to be used to maintain order in a still chaotic world. But the type of force and its application is likely to be quite different than in the past. I think it is reasonable to suggest that the wars of the 21st century might look more like cooperative policing than the wars of times past. Threats now come from small groups and small weak states. Terror networks resemble criminal gangs and organized crime more than an opposing army. It is hard to imagine that given the values and interests of the powerful nations in the world today that an old-fashioned, World War II style industrial war is would be pursued. If this is so—if this is indeed the future of war—it might be possible to do better than we have in the past when it comes to upholding certain rules and norms. We may not perform to our ideal norms. We may often fall short. But perhaps Pinker is correct. Perhaps our performance is getting better because our values are shifting toward a more demanding set of expectations. Whatever you decide on this question of moral progress, there is no escape from the fundamental aspects of the human experience of war that are, in some ways, unchanging. Human emotions and sentiments are both time bound and timeless. We have no better example of this than an encounter with a text like the Iliad. I hope that like me, you finished the poem with a sense that we have come a long way in 3,000 years, and yet we still have a long way to go. There is excitement in that. And I suppose there is also some comfort in recognizing that our struggles are similar to the ones faced by those who came before us, and those who will come after.